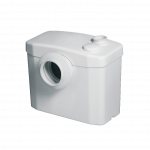 When you are looking for a pump that is both powerful and compact, the Sanivite Waste Water Pump is the perfect solution. 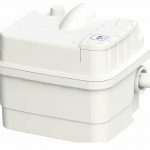 Featuring four connection inlets for connection to a wide range of domestic appliances and sinks, this pump is ideal for any kitchen or utility room. Whether you have an annexe with a kitchen or you need extra facilities in your utility room, this pump will deliver powerful operation when and where you need it the most. One of the best reasons to choose the Sanivite Waste Water Pump is the freedom it gives you over your appliance installation. Whether you need a washing machine in your garage or a basin in your workshop, this pump offers you total flexibility and can be installed almost anywhere. 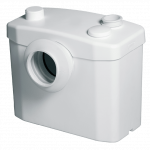 If space is an issue or you want a concealed installation, the pump is small and perfectly formed. It can easily be installed behind a removable panel for easy access and is very simple to fit. The quiet operation of the Sanivite Waste Water Pump is one of its most beneficial features. However, when it comes to power, this pump really delivers. 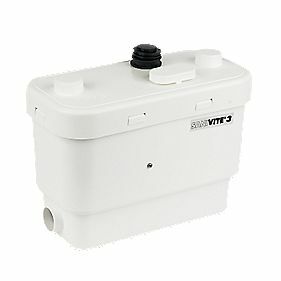 Perfect for areas that need hot water, this reliable product from Sanivite is a great choice. 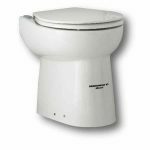 When you are looking for a pump that is discreet, powerful and affordable, the Sanivite Waste Water Pump is the perfect choice. We offer this product and many more at reassuringly competitive prices. We also offer fast delivery across the UK – perfect if you need a new pump in a hurry. Our team is standing by right now ready to take your order or you can order online 24 hours a day from the comfort of your own home.